Author: Thomas Geider †. Series edited by: Wilhelm J.G. Möhlig. 16 pp. Roman, 773 pp. The ogre (man-eater) is one of the most prominent figures in African narrative culture. Despite the meaning of this character, so far systematic analyses and interpretations were lacking. With the present monograph on the narrative culture of the Pokomo of Kenya, the author has filled this gap for the first time with the present monograph. The basis of this study is a corpus of 25 folk tales which have been recorded on audio tape during a fieldwork of several months. In the book these texts are given in the source language Pokomo together with a German translation, the latter also containing information regarding the speech itself, like intonation, speech rate and expressiveness. A grammatical sketch introducing the documentary part (the second part) describes the basic structure of this under-researched Bantu language. 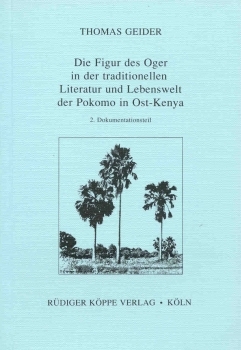 The study focusses on the symbol analysis of the ogre in the context of Pokomo culture. An ethnographic introduction of the Pokomo is given before the actual analyses. Despite the emphasis on the man-eating figures, human beings, which are their antagonists and the “real heroes” of the stories, are part of the analysis as well. The relevant emic information of the native informants is strictly separated from the etic statements of the researcher. Detailed methodological discussions, including a report on the exact situation in the field, integrate the figure analysis into the africanistic and anthropological research context. This monograph includes a stylistic-rhetorical analysis of the oral means of presentation (performance). However, despite its monographic orientation, it is very suitable for comparative studies. Eine außergewöhnliche Arbeit, die vor allem durch die umfassende Dokumentation und die Kontextdaten der afrikanistischen Textforschung noch lange als Basis dienen kann. Thomas Geiders Arbeit wendet sich nicht nur an den regional oder speziell an oraler Literatur in Afrika Interessierten, sondern empfiehlt sich auch allen, die eine eigene Feldforschung vorbereiten oder an die Bearbeitung eines Textkorpus denken. Werner Graebner in Tribus, 40/1991, pp. 222f. Der Titel dieser Arbeit klingt allzu bescheiden. Denn was in den 774 eng beschriebenen Seiten geboten wird, ist nicht allein eine Darstellung der Oger-Gestalt einer kleinen Volksgruppe in Ostafrika, sondern eine grundlegende Studie für die afrikanische Erzählforschung schlechthin. Das Ziel des Autors ist es, über die bis jetzt bestehenden, einseitigen Untersuchungen der verschiedenen Forschungsrichtungen hinauszukommen und vor allem die konventionelle Kluft zwischen Afrikanistik (Sprachwissenschaft) und Ethnologie (Kulturwissenschaft) zu überbrücken. [...] Der Autor selbst folgt seinen Forderungen und bearbeitet sein Thema von einer Vielzahl von Gesichtspunkten der modernen Ethnologie, Erzählforschung und Linguistik. [The book] is a monumental work in two senses. First, it is massive in its scope and in its treatment of the ogre motif in relation to the traditional literature and "cultural space" of the Pokomo. Second, despite the highly specialized ring of the title, it is an interdisciplinary work with a strong anthropologigal thrust. Geider's work should therefore attract readers with a wide and varied range of interests. [...] Longstanding theoretical and methodological problems are critically reviewed in an attempt to formulate more appropriate perspectives on the problems under consideration: researchers' outlooks on the people and cultures they study, research procedures and practices, data collection, sampling, transcription, translation, and subsequent analysis.